Happy New Year my friends! I took the last two weeks off and spent time relaxing and celebrating with my family. It is January 2nd and I am excited to be back to work and a normal routine. 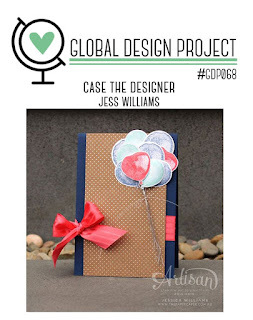 To kick off the 2017 Stampin' Dolce blog year I have a simple project for you today for the Global Design Project Challenge GDP068. For me, January means simple. I like the clean feeling of the house after the Christmas decorations are taken down. I like the quiet winter nights at home. I like that we avoid restaurants and take out. It is all just a little bit more simple in January. When I was creating this card I was tempted to add a stamped image, some twine or thread or some pearls or diamonds. In the end I decided that it was perfect the simple way that it was. I stamped the background Mint Macaron Cardstock with Whisper White Craft Ink and the Touches of Texture Stamp Set. Remember if you are stamping with Craft Ink on Cardstock you need to give it time to dry. If you do not have time to let it set you have heat it with a Heat Tool to speed up the dry time. My trick the the perfect bow ... Wrap the 5/8" Ribbon around the Night of Navy Cardstock and adhesive to the backside. Tie a bow and use a Mini Glue Dot to add it to your card. I have been told that I have a talent for tying bows. Some of my customers are bow challenged and they love it when I tie bows for them. For years I have tried to walk people through tying bows but I think it is just that practice makes perfect. Do you have any bow tying tricks? I hope that you are having a crafty start to the new year! I have loads planned for the blog this year! Of course you can watch for me each Monday with the Global Design Project. You can follow the blog my email (scroll up and find the field on the right side of this blog). This will send you email notifications of new blog posts from Stampin' Dolce. You can also follow me on Social Media to stay in touch! (you will find these links at the top of this post on the right hand side). Visit the GDP to see what the rest of the design team has created. You are invited to stamp along with us! Learn more!! shop with Stampin' Dolce & earn free rewards!